An image from the Hubble Space Telescope shows the bulge of the Milky Way. Many of the fainter stars are sun-like stars orbiting the bulge at different speeds depending on their makeup. Sun-like stars in the Milky Way galaxy's central hub are zipping along at different speeds depending on how they are made, according to new research. 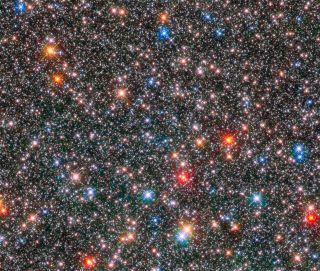 Researchers looking at the bulge of stars near the Milky Way's center found that stars rich in heavier elements — those more massive than hydrogen and helium — move twice as fast as those without. The new findings may help answer questions about whether the bulge formed by the motion of the stars or from an ancient collision with another galaxy, or through some combination of the two. Clarkston, an astronomer at the University of Michigan, was part of a study that combed through nearly a decade of data captured by NASA's Hubble Space Telescope to measure how fast the stars swirled around the center of the galaxy. Whereas ground-based telescopes have measured the movement of the stars toward or away from the sun, the new research with Hubble reveals how they orbit the center of the galaxy sideways along the sky. "Ours is the first study to show that, in the sideways part of that motion, there are differences," Clarkston said. The Milky Way is a classic spiral galaxy, with arms curving in a plane around its bulging center. But the formation of the bulge formation remains a mystery. In the past, astronomers thought that the bulge was made up of old stars, researchers said in a statement, but a growing body of evidence has revealed young stars, as well. Combined with other observations, this suggests that the Milky Way may have suffered a collision with another galaxy in its past. "There are many theories describing the formation of our galaxy and central bulge," Annalisa Calamida, a member of the Hubble research team at the Space Telescope Science Institute in Maryland, said in the statement. "Some say the bulge formed when the galaxy first formed about 13 billion years ago. In this case, all bulge stars should be old and share a similar motion," Calamida added. "But others think the bulge formed later in the galaxy's lifetime, slowly evolving after the first generations of stars were born." To better understand how the bulge came to be, Clarkston, Calamida and their colleagues turned to nine years of archival Hubble data to track how about 10,000 of the bulge's normal sun-like stars moved. They then relied on spectra from the European Southern Observatory's Very Large Telescope in Chile to help estimate those stars' chemical composition. After comparing the two, the team discovered that the motions of bulge stars varied depending on a star's chemical composition. Stars high in metals — for astronomers, all elements other than hydrogen and helium are considered metals — circle the bulge at a higher speed than older, metal-poor stars. "We actually dissected chemically these stars into metal-rich and metal-poor," Clarkston said. Charting the motion of the stars compared to one another revealed what Clarkston called the "fingerprints" of the two populations, a smeared graph that highlights their different velocities. "There is a definite sense of rotation that seems a bit startling," Clarkston said. Like fingerprints at a crime scene, the new results don't immediately indicate what happened in the past, but they provide strong clues to follow up on. "The stars in our study are showing characteristics of both models," Calamida said. "Therefore, this analysis can help us in understanding the bulge's origin." Metal-rich stars could have formed from the material expelled by previous generations of stars, with different birth scenarios causing a difference in velocity, or they could have been brought in by a colliding galaxy, she said. The new data will help the scientists better understand the bulge's formation. According to Clarkston, other researchers are already plugging the discovery into models, which will make detailed predictions to test the observations. "Having found the fingerprint, we want to develop the forensic science so we can develop in detail how the bulge actually worked," Clarkston said. The new research will serve as a pathfinder for NASA's James Webb Space Telescope, set to launch in 2019. One of the new telescope's tasks will be to probe the archaeology of the Milky Way. In the meantime, Clarkston's team plans to comb through the archival data for even more stars, comparing their chemistry to their rotation. "Hubble gave us a narrow, pencil-beam view of the galaxy's core, but we are seeing thousands more stars than those spotted in earlier studies," Calamida said. "We next plan to extend our analysis to do additional observations along different sight-lines, which will allow us to make a three-dimensional probe of the rich complexity of the populations in the bulge."